One point must be clear from the very beginning: EPDs work. When we select parents based on EPDs the genetic merit for that trait increases in our herd. When we select the parents using EPDs the performance of the next generation improves. EPD stands for Expected Progeny Difference. These three words are loaded with meaning, thus the need to define them here. The most loaded word is Expected. Here we use Expected the way a statistician would use the word. Expected means we are making a prediction of a future value. But, in this context, Expected also means we are describing the average of a group. What is the group for which we are predicting the average? We are predicting the average performance of the Progeny or calves out of an animal. An animal’s own performance and its EPD can be quite different, because that is not the purpose of an EPD. The EPD is predicting the average performance of that animal’s calf crop. Finally, EPDs are used to measure Differences. A single EPD profile is useless. We must compare the EPD between two animals or compare the EPD to the breed average. Figure 1. 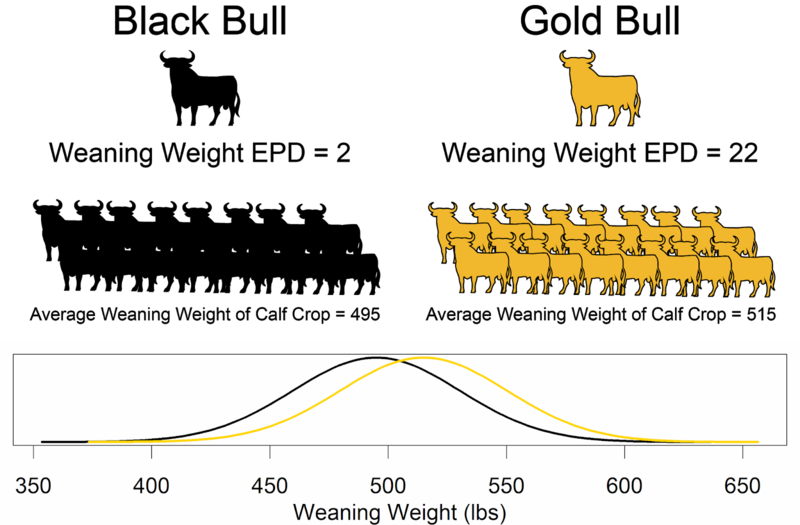 Example of Weaning Weight EPDs, calf crop weaning weight averages, and weaning weight distribution of two hypothetical bulls. Top Dollar Angus, Inc., Gardiner Angus Ranch, Triangle H Grain & Cattle Co., and Zoetis, Inc. conducted a field test of the $BEEF economic selection index in Angus cattle. (See https://www.cabpartners.com/articles/news/3213/FieldTesting$BeefJan2017.pdf for more information.) An economic selection index is simply a genetic prediction of profit differences. The economic selection index predicted a profit difference of $187.38 per head between the High $B group and the Low $B group in their trial. The actual profit differences were $215.47 per head between the two groups. Thus, the economic selection index accurately predicted profit differences between the two groups. The Zoetis GeneMax Feeder Advantage Scores (genomic predictions) also predicted the genetic differences between the two groups. Along with several other traits, we analyzed weaning weights records from the University of Missouri’s Thompson Research Center commercial cowherd. For every 1 pound increase in a sire’s WW EPD, we observed a 0.94 pound increase in the average of his calf crop. This is not statistically different from the expected value of 1. In other words, a sire’s EPD predicts the performance of his calf crop. We also validated Zoetis GeneMax Advantage tests at Thompson Research Center. GMX scores are on a 1 to 99 scale, with 50 being average. The GMX score of the cow significantly predicted the calf’s performance for Weaning Weight, Milk, Marbling, Carcass Weight, and Fat Thickness. For example, a 1 point increase in GMX Score predicted a 0.57 pound increase in the calf’s weaning weight. A cow with a Weaning Weight GMX score of 99 would wean calves that on average weight 55 pounds heavier than a cow with a Weaning Weight GMX score of 1. At the Thompson Research Center weaning weight performance has been increasing by 1.5 pounds per year. This is not the genetic trend, but the actual change in performance. While a 1.5 pound difference between 1996 and 1997 is not a big deal, a 30 pound difference between 1996 and 2016 is substantial. Add this to improvements in calving ease, marbling, carcass weights, all while moderating mature cow size, and the impact of selection using EPDs becomes evident. There are a few issues to be aware of when using EPDs in commercial operations, including: traits without EPDs available, selection for optimal performance, multiple trait selection, and environmental stressors. While the number of traits for which there are EPDs available is growing, not all important traits have EPDs. One example is structural soundness. Currently, farmers and ranchers must use visual appraisal when selecting for structural soundness. However, this does not have to be the case. What is needed is data collected and analyzed to produce soundness EPDs. For example, the American Angus Association has published a research Foot Score EPD. Other breed associations have conducted research projects related to structural soundness. Some breed associations now publish EPDs for Heifer Pregnancy and Stayability/Reproductive Success. We do not have predictions for male fertility. For most traits that are economically important, but lacking EPDs, what we need is simply more data collection. Unfortunately, when using EPDs a common mistake is selecting for extremes. For many traits this is not a problem. However, there a few traits that we need to watch. Milk EPDs are one trait farmers and ranchers should watch. This is especially true in environments where forage resources are limited, such as the Southwest. Cows with high Milk EPDs often fail to perform at their genetic potential. Further, high Milk potential leads to larger internal organ size, which increases the maintenance requirement of these cows. So, not only do these cows fail to reach their genetic potential, they also underperform compared to cows with more moderate Milk EPD levels. Another drain on maintenance is mature cow size. We do not want cows that are too large, require extra resources for maintenance, and struggle to become pregnant. We also do not want cows that are too small and sacrifice the growth potential of their calves. One of the most under used traits is the Mature Weight EPD. Just as we have breed cattle who bend the beginning of the growth curve from birth to weaning, we also need cattle who bend the end of the growth curve from yearling weight to mature weight. We are also receiving reports of extreme birth weights, specifically calve that are too small. Birth weight is an indicator of calving ease. We want calves that are small enough to be born without difficulty. But, we do not want calves so small that they struggle to thrive once born. One way to avoid this trap is to select on Calving Ease Direct for bulls and Calving Ease Maternal for females, and not use actual birth weight and Birth Weight EPD in selection decisions. Another challenge for commercial producers is identifying which traits are most important and placing proper emphasis on the various traits. We have all learned that single trait selection causes major issues. But, for many the question remains, what traits should be emphasized and how much focus should I put on different traits? In other words, how do I use the information to make a decision? 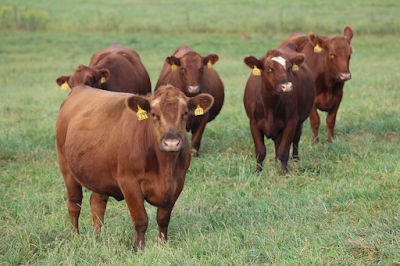 What is the most important trait in beef cattle production? The answer, if given a friendly hint, is quite simple. The most important trait in cattle production is profit. Economic selection indexes are genetic predictions (i.e. EPDs) for profitability. Economic selection indexes weight each EPD trait by its economic importance and combine them into one number. Economic selection indexes allow us to use multiple trait selection, focusing on our economic wellbeing. Selection indexes also simplify our decisions because they combine all of the information into one number on which to rank cattle. Cattle performance at commercial farms and ranches can suffer when there are interactions between genetics and environment. These interactions between genetics and environment can cause cattle to re-rank between environments. In other words, the most profitable bull who produces the best calves in one environment may not be the most profitable bull in a different environment. Cattle in challenging environments may see re-ranking compared with national cattle evaluations. These challenging environments may include the Gulf Coast with heat and humidity, Desert Southwest with heat and limited feed, Fescue Belt with toxic fescue, and the Rocky Mountains with altitude stress. Until selection tools that consider these environmental stresses are published, producers in these regions may want to purchase genetics raised in a similar environment to theirs. Two USDA-NIFA funded research projects are investigating environmental stressors, one lead by the University of Florida and the other lead by the University of Missouri. The goal of the University of Missouri research is to prototype the use of environmental region-specific EPDs. These region-specific EPDs will allow us to match a cow’s genetics to the environment she is producing in. Farmers and ranchers who manage beef operations, whether seedstock or commercial, need to fully embrace the use of EPDs. Genetic evaluations and the EPDs they produce are old technologies that are firmly on the plateau of productivity. However, far too many producers fail to use the technology. Some of this blame lies on academics and industry professionals. We have failed to explain EPDs in a way that the average farmer and rancher can understand and trust. We continue to work to publish EPDs for all traits that are important to beef producers. Further, we have failed to account for environmental stressors that reduce the predictive ability of EPDs. Academics and industry professionals are currently working to remedy these issues. However, beef producers are independent and take responsibility for their own operations. For the beef industry to be successful and sustainable, independent-minded producers must realize the value of EPDs. We value the traditions that have been handed down to us. But for there to be a vibrant beef industry for the next generation, we must use genetics properly to be more profitable and sustainable.